There's a reason that Verdi's tragic romance La traviata is one of the most popular operas on the planet. Of course, there's the music, with exquisite arias like "Sempre libera" and the mournful "Addio del passato." Then there's the bittersweet love story of the beautiful, pleasure-loving yet frail courtesan Violetta, who unexpectedly finds true (and ultimately tragic) love with a younger man. But above all, what sets La traviata in a league of its own is its humanity and its heart. It's a truly timeless tale of moral hypocrisy and selfless sacrifice, and in the character of Violetta, Verdi and librettist Francesco Maria Piave have given us one of opera's most fascinating heroines, a woman of boundless humanity and emotional depth. "...No opera really sings unless it rings true to its psychological core, and Lyric Opera of Chicago has that rare winner in its current run of Verdi's "La Traviata." The beloved work can become time-worn, but this version resounds with the insights of an electrifying, largely young cast and leadership crew that seems singularly focused on theatrical truth." "...Every opera that gains such enduring popularity as to acquire the epithet �warhorse� was once, well, a colt � exhilarating in its spunky freshness, its beauty undimmed by long familiarity and habitual service. The real marvel of Lyric Opera�s current staging of Verdi�s �La traviata� lies not just in its lustrous surfaces but rather in its surprising depth, in its true and affecting recovery of a splendor beyond � or, more to the point, before � habit." "...La Traviata has some of Verdi�s most memorable music, including some of the most stunning coloratura ever written. Shagimuratova has proved from past performances that she is capable of singing this repertoire, but she was not singing her best on opening night. Assuming that she pulls herself together, this production will be well worth watching, even for those who saw it earlier." "...Luxury, sundered lovers, and a vacuous society that devours itself; what�s not to love about La traviata? Originally performed in 1853, this opera by Giuseppe Verdi happened to debut the same year as Il trovatore, the other Verdi opera the Lyric performed this season. But although a few stretches of music are similar, in subject and in original production director Arin Arbus�s presentation, La traviata is as intimate and contemplative as its twin is bombastic. Adopted from a semi-autobiographical novel and play by Alexandre Dumas fils, it contains a more authentic pathos than was typical on nineteenth century stages where subjects like courtesans and tuberculosis were seldom addressed directly, and as demonstrated by the Lyric�s current revival, it can still capture the hearts of modern audiences." "...Berrugi is passionate and impetuous as the youthful Alfredo, dogged by his stolid father�s cautious ideals. Shagimuratova�s voices shines across the range of Violetta�s experiences, supple and bright in merriment and romance, glowing faint as an ember as she succumbs to heartbreak and a conveniently unnamed nineteenth century malady. What the design team (Riccardo Hernandez�s set, Cait O�Connor�s costume and puppets, Marcus Doshi�s lights, and Christopher Ash�s projections) achieves is remarkable: a hypnotic show of light and shadow that reveals the hellish parade marching ominously alongside every human body." "...The production of Verdi�s �La Traviata� (�The Fallen Woman�) that returned to Lyric Opera for the first time since 2013 is a beauty on all counts. But its greatest virtue is the way it emphasizes the essential intimacy of the work, with each of its three major characters delivering virtuosic, soliloquy-like arias, as well as joining for richly dramatic duets and trios against the backdrop of the lavish social whirl and blatant hypocrisy of mid-19th century high society Paris." "...I want to single out soprano Albina Shagimuratova as Violetta for praise. She is on stage for most of the show and carries the third act almost entirely alone. Her voice is beautiful and warm. Her presence is entrancing. You can hear the transition in her character over the course of the show and how she sings. Any time a show portrays a character as so captivating that they propel literally all the action, it can live or die on how alluring the star is. Shagimuratova's performance is more than up to the task." "...LA TRAVIATA provides a perfect winter escape. It may be cold outside but there is a party -parties- going on at the Lyric. Love, lust and champagne is flowing nonstop. And even though this love story is tragic, it is beautifully told. " "...Director Arin Arbus�s staging is also to be commended. Her resum� shows her to be primarily a director of traditional drama and she takes a similar tack with her opera staging, favoring realistic action and blocking rather than a presentational style that would detract from the personal drama that is meat of the story. The aforementioned scene between Violetta and Giorgio, for instance, resembles in style nothing so much as a scene from Ibsen or Chekov and is more powerful for it." "...As the cast, conductor and director accepted their standing ovation at Saturday night's performance, it was a moment to reflect on not only the world-class productions (even in their missteps) Lyric brings to Chicago, but on the robust live theater scene throughout the city. Here were something like 3,000 opera fans dressed to the nines and gathered downtown on a cold February night for La Traviata. A few blocks away, another thousand or so keep Hamilton performing to sold-out crowds eight times a week even after two years. And within a three-mile radius, who knows how many touring, storefront, experimental and in-progress works are presented on any given night. It's all a wonder, and that we have such options, such diverse and worthy experiences at our fingertips at all, is something to celebrate." "...How interesting to hear in the pre-concert lecture that this opera was not an immediate hit. How could that be? Every note seems to create a thirst for the next. This is music as only Verdi can do it. 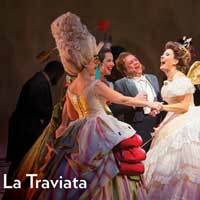 If you haven't experienced La Traviata before, this is a top pick entertainment option-cold weather be darned."